The AKG P 2 is a dynamic microphone in AKG’s new Perception Live series. 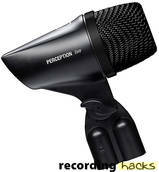 The mic is designed for kick drum and bass instruments for stage use. The P2 features an all-metal body, integrated stand mount, and humbucking coil for EMI/RFI noise reduction. The P2 ships with a carrying case. The body has an integrated hard mount. The AKG Acoustics P 2 is also known as: P2.